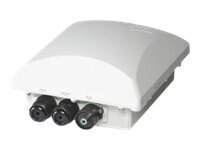 The Ruckus ZoneFlex 7782 series comprise the 802.11n outdoor access points featuring the option of a 30° narrow beam antenna, a 120° antenna, internal omni-directional antennas, or an external antenna version along with BeamFlex technology to deliver up to 7 dB of additional signal gain and up to 15 dB of interference mitigation. The ZF 7782 series was specifically designed to address the needs of very high-density deployments such as would be found around stadiums, arenas, airports, etc. These venues are characterized by tens of thousands of people in close proximity to each other and most are carrying mobile data devices of some sort. These are amongst the most challenging wireless environments imaginable and are ideally suited to Wi-Fi technology. High-density best practices usually call for a large number of AP's to get the needed capacity, but care must be taken to limit co-channel interference. The ZF 7782 series also features a very minimal form factor with integrated antennas which is essential in many deployments including light poles (aka street furniture) in major metro areas. These are great locations for outdoor AP deployments, but the entity that owns the poles will usually require that any AP be as unobtrusive as possible. The ZF 7782 series is one of the most compact units in the industry. Other key ZF 7782 series capabilities include support for up to 500 concurrent users, integrated GPS receiver for location based services, spectrum analysis, hotspot 2.0 support for seamless roaming, SmartMesh wireless backhaul, ChannelFly support, PoE-out to power collocated small cells and much more. The ZoneFlex 7782 series can be deployed as a standalone AP and managed individually, or centrally managed by the ZoneDirector WLAN controller or through the SmartCell Gateway 200, which also provides connectivity into the mobile packet core.